I love a chance to celebrate! New Year's Eve is one of my favorite holidays because you can celebrate really simply or extravagantly and either way is great. It isn't a high stress holiday in my mind and just doing anything together as a family is our goal! 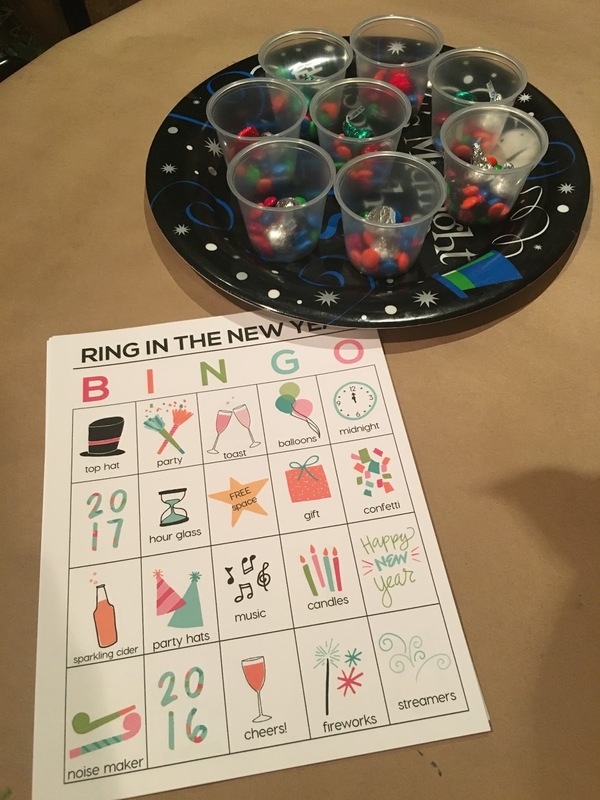 Each year I love to find a few simple and easy activities to try out on New Year's Eve. I try and keep the materials and prep to a minimum. 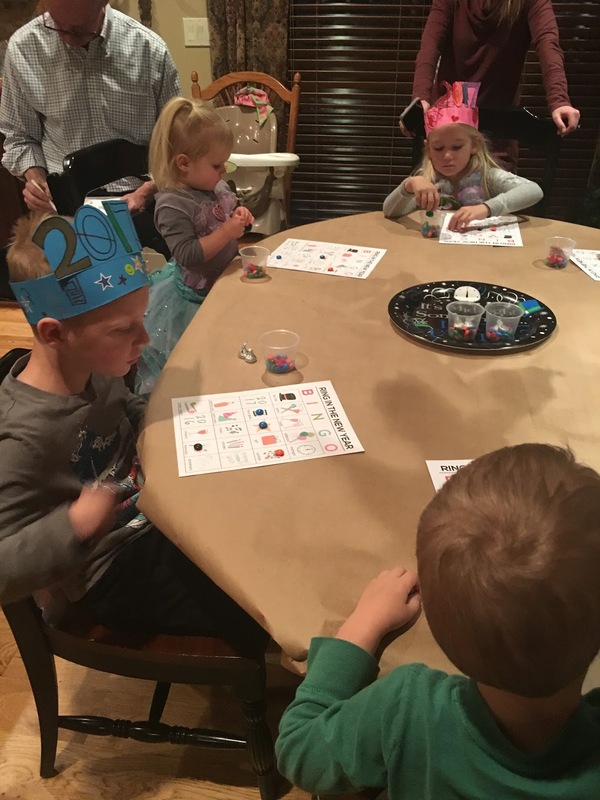 Here are a few of our favorite New Year's Eve activities for kids last year! Each year when we plan out our schedule, we plan a simple movement activity followed by a craft or snacktivity. To get started with our NYE countdown, we stuck up a big balloon clock on the wall. Inside each balloon is a piece of paper with an activity on it. 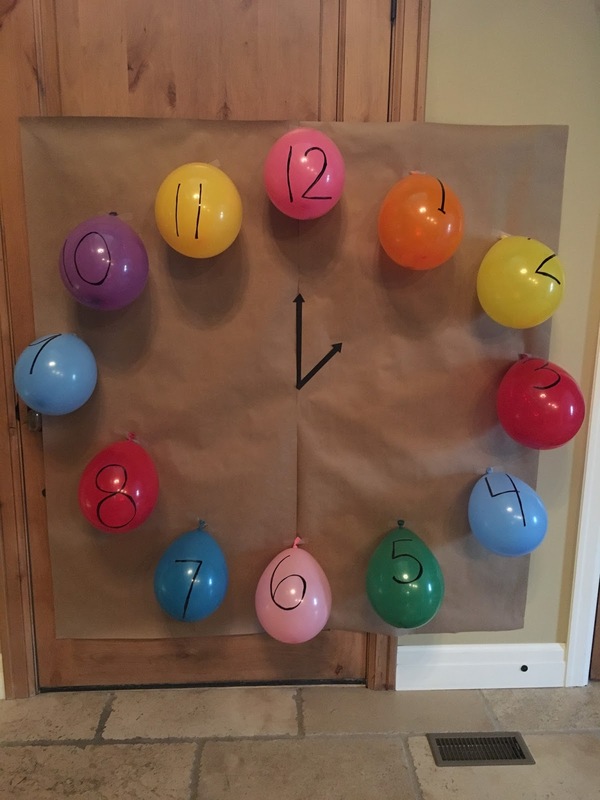 Every 15 minutes (sometimes every 30 min depending on the activity), we would pop a balloon and find a new activity to try. We originally had 12 activities, but we skipped a few of them because some of the other ones took more time than we expected. The goal was to have fun and not cram in tons of activities, so sometimes you have to be flexible and skip some of the activities you plan! To make our New Year's Eve hats, I just drew bubble letter numbers, cut them out, and then taped them to long pieces of cardstock. The kids decorated their numbers and hats with markers and stickers, then we stapled them together to make a crown/hat, and then they were set to wear them whenever they wanted during our celebration. To make NYE pizza, we just got some pizza dough from the grocery store and shaped it into the year. The kids each got a portion of the pizza that was "theirs" and they each decorated their part of the pizza with their favorite toppings plus cheese and sauce. We cooked the pizza in the oven and then ate it once it was done. YUM! My mom loves making trifles. Trifles in fun New Year's Eve themed plastic glasses is more fun than in a regular cup. We set out ingredients for trifles and then the kids each assembled their own. 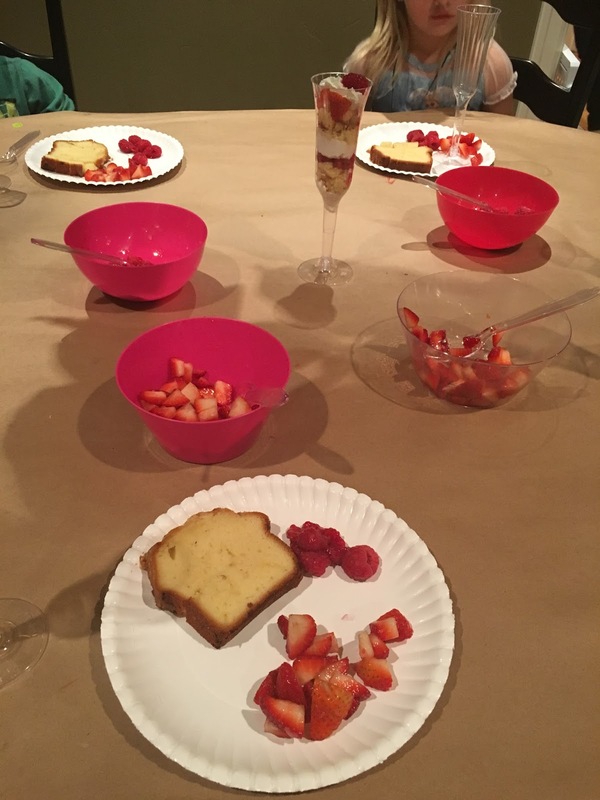 They added strawberries & raspberries (cut up), pound cake, and whipped cream. They loved using their own knives to cube the pound cake. Littler toddlers can skip the cutting step. Our main activity was building cup and plate towers. The kids who got the highest tower that stayed up, won... but really everyone that participated won. There are so many fun minute to win it games on the internet. This is just one fun one we tried. 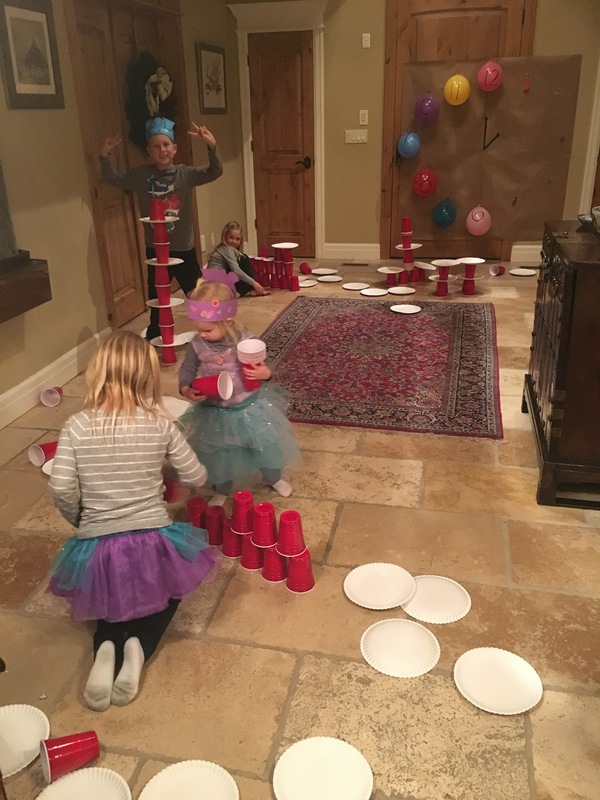 We didn't time anyone and they kids built their towers again and again. This was one of the activities that the kids really liked, so we skipped some other planned activities and did this one longer. Every year I love downloading New Year's Eve BINGO cards from Thirty Handmade Days. Theyare adorable. Along with a BINGO card, we give each kid a cup of treats to use as markers while they play. Some kids just eat their treats and don't play. Some eat WHILE they play!. Ask your party people for their favorite tunes from the year and then kick off a dance party! We always end the night watching the Ball drop on Youtube (from a previous year) or any other spots that show an earlier countdown. We try and count down till 7pm or 8pm so that we wrap up moderately early so we can get kids to bed on time. After our countdown, we like to drink sparkling apple cider in fun glasses and clink them together (without spilling). Then we run outside to shoot poppers and play with a few little mini fireworks/sparklers. Some years we just drink sparkling cider and watch the countdown, but other years we like to kick it up a notch and plan out some easy and simple activities. We hope that however you ring in the New Year this year, you have fun doing it! Hopefully a few of these ideas can get your juices flowing. 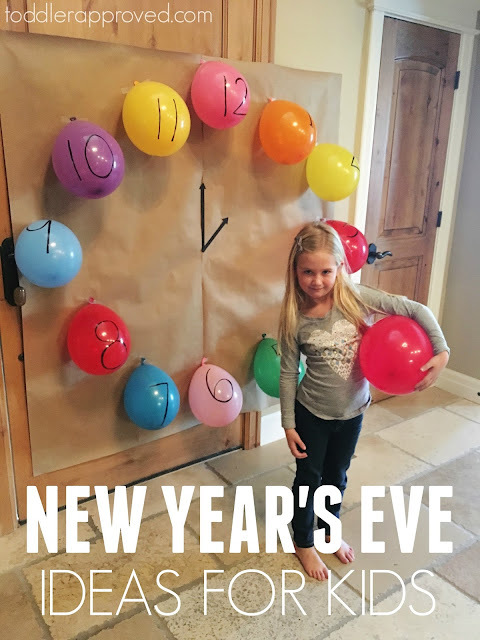 We have more creative ideas pinned on our New Years Eve board on Pinterest. 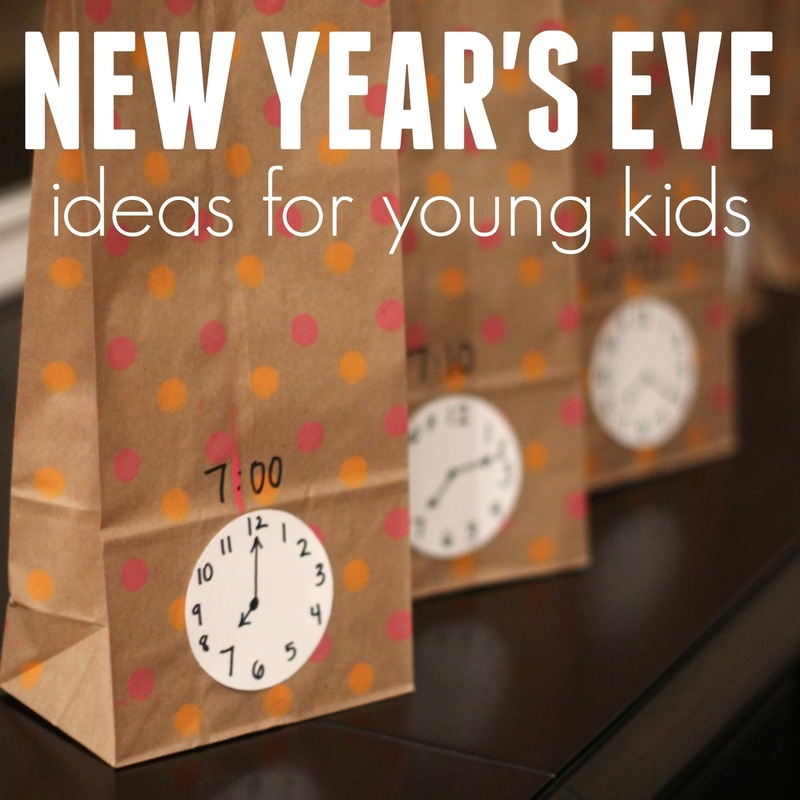 You can find more of our favorite New Year's Eve ideas for young kids here. Please share any others that you've tried in the comments below. What wonderful ideas! I love it! Can't wait to use some of the ideas with my granddaughter. These are wonderful ideas for a New Years celebration with little kids! I'm going to add a few to our plans for New Years! These ideas are great. My youngest daughter was born on December 31, 2013, so this year she'll be turning 4. Maybe we can incorporate some of these ideas into our birthday party for her. I am sure she will love the dance party and crown ideas. 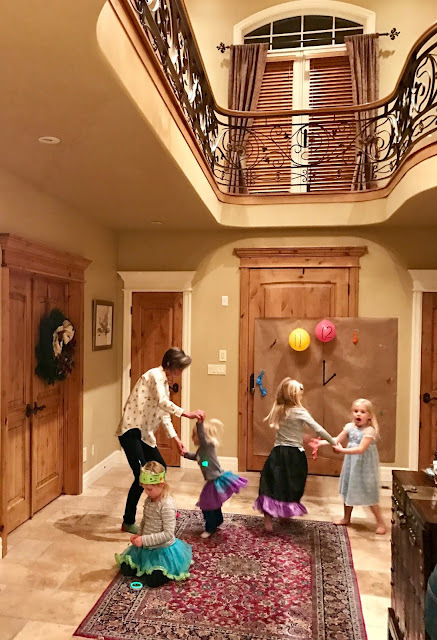 These are all such wonderfully entertaining family oriented activities for New Years Eve and even modified for birthdays they will be terrific. Thank you so much for sharing. An activity I find the children enjoy is a toss game. So easy to create too. I cut a card board box into a wedge and cut staggered holes into it which are numbered after I painted and decorated it with the event's theme. We used foam balls 3 turns each tallying points winners of each round got to pick a song or TV show for the evening or through the week. One prize was no chores for a day. Hope that is something someone can utilize. Thanks again. What great ideas! I was torn about what everyone does about getting their kids to bed on time...this looks like fun! Love your ideas! As a Grandma of kids at varying ages, a couple of the ideas work for all ages!